As part of my Baumohl series on US Indicators, here is the press release on the August PPI data. The PPI (Finished Goods) increased a seasonally adjusted 1.7% in August. July saw a .9% decrease and June a 1.8% increase. If we are looking for signs for the economy it is a good sign that things are again improving. If we look at the last 12 months, 8 of the 12 months saw declines in the PPI including 5 straight months from Aug 08 through Dec 08. 4 of the last 5 months have seen positive advances. What about Cost of Goods sold? I would certainly expect some industries to see their COGS rate start to increase. If we remember back to late 2007 and early 2008, ingredient prices started to rise dramatically. 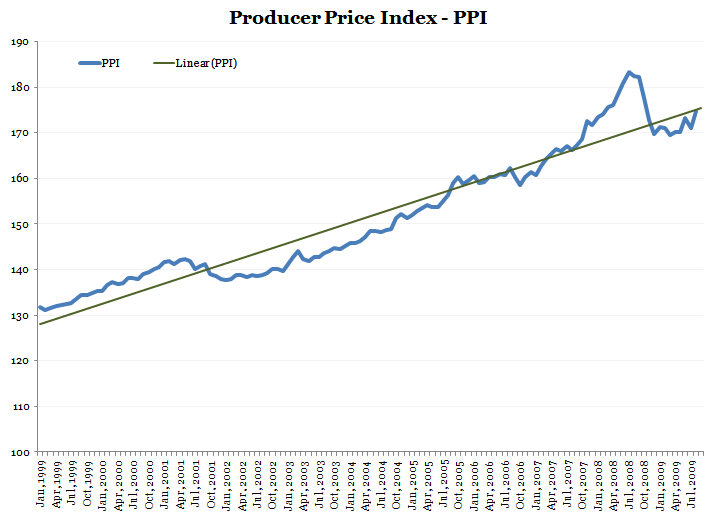 See the chart below and notice the area where the PPI was elevated quite a bit about the trend line. What does it mean to your business? It clearly depends on the industry and your ability to act on external data. If you are a bread manufacturer and your margins are pretty lean, you might need to look somewhere to balance your expense ratios. Investing? Look at your portfolio. What industries are you invested in? How does the PPI impact those companies? If we are seeing the trend return to perhaps the elevated levels of late 07 / early 08, perhaps there are some solid opportunities? Look at how those companies did during those time frames in terms of performance?